Retail sales have again bucked the trend of positive indicators surrounding the economy, registering a 0.7 per cent drop in October, primarily on the back of falling car sales. However, when the volatile motor sector is excluded from the picture, sales rose by 0.3 per cent on the previous month, suggesting recovery in the sector is continuing, albeit modestly. Tayto crisps, Cadbury chocolate and Kerrygold butter are the brands Irish emigrants miss most when overseas, according to the latest ‘Diaspora Decides’ study by Checkout magazine, in association with Behaviour & Attitudes. 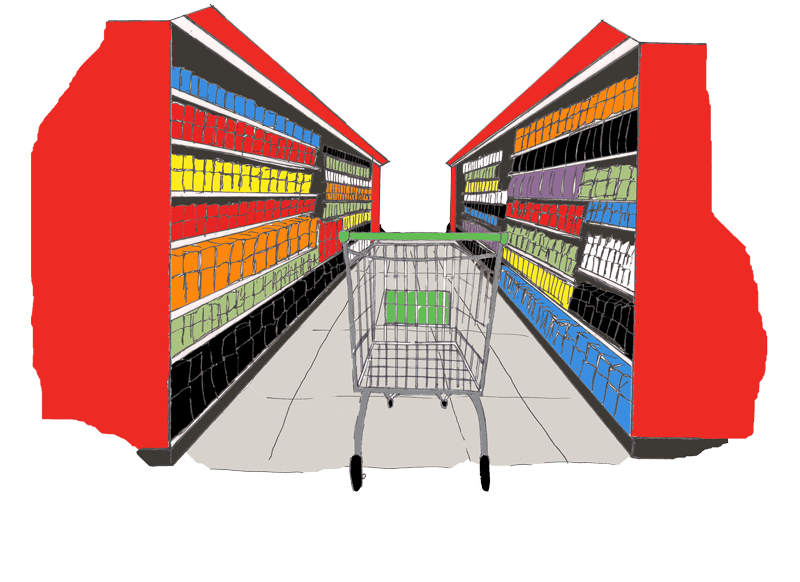 80% of Irish adults receive supermarket flyers through their doors, according to the latest Consumer Insights survey by Empathy Research. Of 1,122 participants, 79% said they receive flyers from SuperValu, while half received Tesco flyers through their doors. Other top supermarket flyers included Dunnes Stores (36%), Lidl (24%), Centra (24%) and Aldi (22%). Irish retailers look set to have their best Christmas trading period since 2009, according to the Retail Christmas Monitor 2014. The Retail Ireland monitor tracks key trends across the economy and the sector to give an insight into how they are likely to impact the key Christmas trading period. Irish consumers will spend an estimated €528m on food and drink this Christmas — over €100 a head. A survey carried out by Webloyalty found more than three out of four people plan to spend up to €20 per person on Christmas dinner, with the majority planning to do their festive food shopping in-store (70.1%). Only 9.1% said they would do all of their Christmas food shopping online. Shoppers will splash out almost €4billion next month in what is set to be the biggest Christmas spending spree since the crash. Santa is set to come early for the country’s shopkeepers with predictions that this is going to be the most profitable Christmas in over five years. Ireland's beleaguered retail sector is braced for a bumper Christmas, it has been claimed. A rise in employment, higher disposable incomes and the return of the feel-good-factor has prompted predictions from a leading business body of the best Christmas in five years. Three quarters of consumers here will do most of their Christmas shopping in traditional stores, with just 23pc planning to split their purchases between the high street and online, a Bank of Ireland survey shows. However, online shopping is clearly on the rise as some 72pc of those who will indulge in it are aged between 18 and 34, with Amazon and eBay the most popular sites. It was sedately busy on Dublin’s Henry Street, as shop workers relished being “rushed off their feet” after spending a long and recessionary time kicking their heels. At the same time, Black Friday was inspiring insurrection in the English suburbs as punters wrestled with each other to secure bargain flat-screen TVs. Christmas has come early for the country’s retailers as Black Friday yesterday prompted a spending frenzy which is almost certain to last for the next 26 days. Massive discounts from some of the high street’s top names, combined with an upturn in the country’s fortunes, dragged people into cities and large towns in their droves. The first Monday in December is the busiest day for online shopping and has been dubbed ‘Cyber Monday’. Visa Europe has revealed that Irish online shoppers are set to spend €22m on the day, a 17pc increase on last year. Visa Europe predicts £518 million (€653 million) will be spent on its cards today, Black Friday, making it one of the biggest days for e-commerce. It estimates that online transactions will top 8.5 million today alone, up 22 per cent on 2013. Black Friday, the day after Thanksgiving in the US that traditionally heralds the start of seasonal shopping mania there, has become a phenomenon in Ireland, with some retailers here reporting sales spikes of up to 100 per cent. It’s the tradition that started in US, where the day after Thanksgiving marks the beginning of the Christmas shopping season with big price cuts. It’s grown exponentially in the age of the internet, and now it’s creeping into UK consciousness, and perhaps unsurprisingly retail giant Amazon is at the centre of it. THIS will be the biggest shopping weekend of the year so far, with retailers hoping it will kickstart a Christmas splurge worth over €1bn. Shoppers are expected to spend €74m this weekend on online purchases alone, while Christmas fairs and markets countrywide aim to attract hundreds of thousands of consumers out to spend even more. Black Friday is upon us. What started as an American tradition has become one of the biggest retail days of the year here, with Irish consumers expected to spend about €74m this weekend. So what's the story, and where are the good deals? We've got you covered. Ireland's most famous shopping street is set to recapture the hustle and bustle of the Celtic Tiger era after gaining full occupancy for the first time in seven years. Numbers 57 and 58 Grafton Street have been let to Life Style Sports, while number 23 is being leased to Claire's Accessories. Irish beef should secure access to the US market before the end of this year, according to the Minister for Agriculture Simon Coveney. He made the prediction courtesy of his presentation to the ICMSA Annual Meeting in Limerick. THE Lions Clubs International and Tesco Christmas Food Appeal will take place in all Tesco stores in Limerick on December 5 and 6. The appeal seeks to support as many families as possible in the run-up to Christmas and will run in all 147 Tesco stores nationwide. Supermarket chain Aldi is to sponsor 2fm’s The Nicky Byrne Show with Jenny Greene in a 14-month agreement understood to be worth about €300,000. The launch of the 11am-2pm show last March was one of the big changes to the 2fm schedule shake-up earlier this year, with Greene and former Westlife singer Byrne replacing Colm Hayes, who moved to a drivetime slot, and Larry Gogan, who moved to weekends. Tesco chief executive Dave Lewis last night announced a reshuffle of Tesco's executive committee, which will see the former Unilever man taking control of the business' core UK market. Carraig Donn has announced the opening of four new stores in Ireland as part of a major expansion plan. The four new stores will create 50 new jobs, bringing the total number of employees to 450.